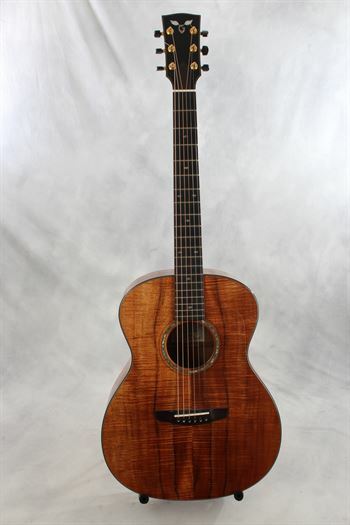 Goodall (used, 2002) Koa Grand Concert Acoustic Guitar - Mandolin Brothers, Ltd.
#KGCK2757, in “excellent plus” condition, with the original hard shell case. The code, which should never be pronounced out loud since it can harm the pomum Adami (Adam’s Apple) or its surrounding tissue, means Koa Grand Concert, and the last K probably means Koa top This guitar is in remarkably clean condition – when you see it you will have a hard time accepting that it is not still new. Its features include an ebony polished headstock overlay, having six gold plated Schaller mini tuners with black ebony buttons. The truss rod cover is matte finish ebony and held in place, like my maternal grandmother, by a single screw. (In those days this was not uncommon). The East Indian Rosewood bound ebony fingerboard is inlaid with etched Paua rosette diamonds at frets 3, 5, double at 7, single at 9, double at 12, single at 15 and 19 and a total of 20 frets. Being a Grand Concert this guitar is 15” wide at the lower bout, and has a long scale of 25.5”. The fingerboard width at the nut is 1 ¾” and the string spacing at the bridge is 2-2/8th. The bridge is fashioned in the wing-ed manner. The neck label reads “Koa, Rosewood, Mahogany, Ebony, Abalone” which sounds like a mantra, and also “Strings: Light or Medium” referring to the type of strings it should be equipped with. “Abalone” citation refers to the soundhole rosette, whose inner ring is gloriously crushed abalone surrounded by black-crème-black purfling. The Koa wood utilized on this guitar shows good horizontal figure on top, sides and back. Goodall equips this guitar with a clear plastic pickguard on the treble side which goes a long way toward preventing those unwanted signs of use. The interesting thing is that if you were to price this guitar today the amount you’d pay for it would be astronomical (like Hale-Bopp – also known as C/1995 O1, but without the tail). In actuality it would list for something like $9,550 (wow). This one, however, is previously owned and so you, clearly, reap the benefits. Even though this guitar was made almost entirely from the fruits of the Hawaiian leeward forests, its sound is buoyant and boisterous, robust and resonant. In terms of sonic superiority it’s right up there with Dolby® Stereo. You are going to love this instrument.